« Day 122 in Beijing: Cruising The Canals Of Zhujiajiao. Day 123 in Beijing: Fish Bites Man (And Woman)! 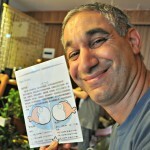 While in Zhujiajiao, our friends David and Isabella treated us to a foot massage. Well, at least that is what they told us when they brought us into a little store front with fish swimming around fish tanks. 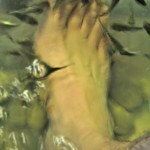 We also noticed that people had put their feet in these same fish tanks and the fish were swarming all around them. I had heard of these massages before and had wanted to try them. 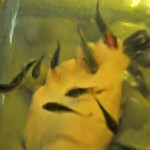 Here’s the deal: These fish give you a massage by eating all the dead skin on your feet. It is quite well known in the more country side parts of China and it seems to be beneficial to one’s health since they remove dead skin that can lead to health issues. 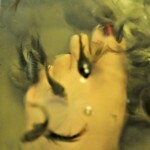 Jill, who has ticklish feet, was a little anxious about it so I hopped right in. I started laughing a little bit, and it quickly became calming and fun. Jill decided that it would be worth a try and seemed to enjoy it as much as I did. She’s the one with the nail polish on her toes and the prettier feet, by the way. The whole massage lasted about 20 minutes and cost about 5 U.S. Dollars. It was well worth it and my feet felt like a baby’s tookus after. If you don’t know what that mean, google it. My grandmother used to use that word all the time and it still cracks me up. Yes, I have gorgeous feet! At least according to hungry fish. Jill’s feet. The fish are having a feeding frenzy! Hungry fish are happy fish!